Top companies around the world turn to MIT's Jonathan Byrnes to figure out where the profit is — and where it isn't. Using his systematic, field-tested approach to analyzing profitability, Dr. Byrnes helps companies quickly determine which parts of the business drain resources and which are worth expanding. Every business has enormous potential waiting to be unleashed; this book offers bold new strategies and practical tools to help you find and grow those islands of profit. 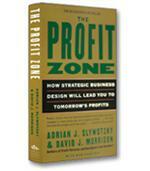 Nearly 40 percent of the average company is unprofitable, according to MIT professor Jonathan Byrnes. On the other hand, 20 to 30 percent of the company is so profitable that it provides all of the earnings and subsidizes the losses. The reason, as Byrnes explains in his book Islands of Profit in a Sea of Red Ink, is that in most companies, no one is managing profitability. In fact, many of today’s budgeting tools don’t even reveal the sources of unprofitability. At a Baby Bell, for example, high volume customers were considered the best customers. They brought in more money. However, one manager did a profitability analysis and discovered that many high volume customers were unprofitable "complainers" who overused customer service support. Simple steps, including automated help lines and frequently asked questions brochures, were enough to make many of these customers profitable. 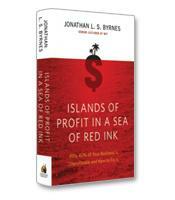 In Islands of Profit in a Sea of Red Ink, Byrnes offers the three key elements of managing profitability: profit mapping, profit levers and a profit management process. Byrnes uses as an illustration the example of a trucking company’s successful effort to manage its profitability. First, the profitability team examined how profits were made and saw a problem. Traditionally, sales representatives would sell to one customer a point-to-point movement — taking a haul from Chicago to St. Louis, for example — and then scramble to find another customer to buy the backhaul — the return trip back to Chicago. The profitability of each was considered separately. Thus, a point-to-point movement sale could be considered very profitable, even if the backhaul was sold at an unprofitable discount. When the team analyzed the profitability of the entire round trip, it realized that many point-to-point customers it thought were profitable were, in actuality, unprofitable because of losses on the backhaul. The book is divided into four sections. The first section, Thinking for Profit, describes the key elements of profit mapping, profit levers and the profit management process. The second section, Selling for Profit, explores two critical profit levers: sales management — for example, whether sales reps are compensated on revenues although not all sales dollars are profitable — and market development — identifying and targeting the customers that bring the most value to the company. The third section, Operating for Profit, focuses on operational issues, mainly supply chain management and product flow. 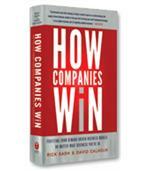 For example, erratic orders from major customers can undermine the profitability of a company. Finally, the fourth section, Leading for Profit, addresses the leadership issues related to changing the mindset and traditional practices of a company to ensure greater profitability. A chapter-by-chapter summary of the book at the beginning allows managers to focus on those chapters that are most applicable to their concerns. 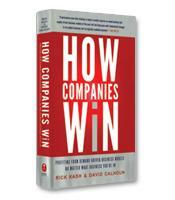 In truth, however, top executives and managers at all levels and in any kind of enterprise should not miss a single word of a business book that deserves wide recognition for addressing the key to survival: making a profit.